Houghton MI and Hancock MI are two small sister cities that face each other across the Keweenaw Waterway, about midway along its length. The Keweenaw Waterway is a canal-like waterway that cuts across the base of the Keweenaw Peninsula, a unique geological formation that protrudes north into Lake Superior. Although two separate municipalities, for our purposes, we will treat them as one destination. Indeed, they cooperate on many service and tourisn initiatives. Both Houghton and Hancock were established in the mid-1840's to survice the booming copper mining industry. The Keweenaw Peninsula is a unique geological lava formation and its creation over a million years ago resulted in one of the most significant copper fields in the entire world. Mined by aboriginal peoples for a millenia, the copper industry became a huge magnet for businesses and immigrant, drawing people from as far away as Finland and Wales. Houghton MI is the location of the Michigan Technical University, a highly-regarded teaching and research institution. Houghton has also been listed as one of the best 100 places to live, according to "The 100 Best Small Towns In America". The area is an outstanding natural region. As the copper mining industry wound down, tourism emerged as a major economic support. As noted further below, the region abounds with walking and hiking trails, spectacular views and outdoor recreational opportunities. A lift bridge across the Waterway connects the Houghton and Hancock and a short walk up either hillside will bring you into the center of these pleasant communities. The approaches to Houghton MI and Hancock MI are clear and easy. The Keweenaw Waterway cuts across the base of the Keweenaw Peninsula. It was created in the 1860's to link several lakes and waterways and form a protected canal across the peninsula, allow freighters to move the massive amounts of copper to markets in the south and to reduce the length of the voyage around the peninsula. There are no locks along its length. Today, it is rare indeed to see a lake freighter in the Waterway but cruising sailors will find this to be a delightful route to take. 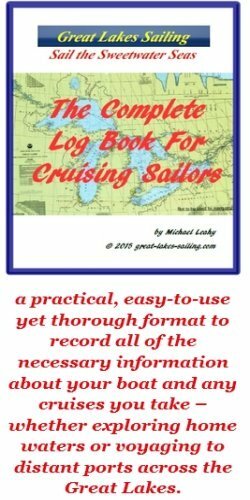 Consistent with the navigation rules for Great Lakes sailing, you are returning from the sea when you enter the Waterway via the Lower Entrance and travel north. RED markers will be on your starboard and GREEN markers on your port. Colors will be reversed when you are heading south. The southern, Lower Entrance is located at 46° 58.087N 88° 25.944W. The entrance is marked with a Fl WHITE Light visible 9.6 nm offshore and a Fl GREEN light to port. A course of 355°T will bring you into the entrance. Leaving the first part of the Waterway, you will enter Portage Lake The route across Portage Lake is well-marked and following a course of approximately 346°T will bring you to the entrance of the next leg. The northern Upper Entrance is located at 47° 14.055N 88° 37.869W. The entrance is protected by the arms of two long breakwalls marked with a Fl WHITE light on the port side, visible 10.5 nm offshore and a Fl GREEN light on your starboard side. A course of 156°T will bring you into the Upper Entrance. The Waterway is well-marked and the channel is dredged to a minimum depth of 15 ft/4.6 m but for most of its length is at least 20 ft/6.2 m deep. Connecting Houghton MI and Hancock is a prominent lift bridge. Vertical height is 7'/2.2 m in the down position and 103 ft/31.7 m when raised. The Bridgemaster is raised on VHF 12 or 16. Openings are generally on demand but advance notice is expected due to highway traffic considerations. Houghton County Marina is the only marina in either Houghton or Hancock. It is located on the north side of the Waterway, in Hancock, immediately east of the lift bridge. It has 54 slips with 10 set aside for transient sailors. There is a fuel dock (diesel and gasoline) and a pumpout station. Water and power are available as are restrooms, showers and laundry facilities. Other amenities include picnic areas, BBQ grills, and a ship's store. Restaurants and other businesses are located to the west of the marina. Houghton City Dock is on the south side of the Waterway, immediately across from the Houghton County Marina. You can tie up along the wall but there are no services. or amenities. From the dock, you can very easily access the restaurants and shops in the downtown, only a block or so away. MM Powersports in Hancock can carry out engine and mechanical repairs as well as prop work. The closest grocery store in Hancock is Monticello's Grocery. You would need transportation. In Houghton, World Foods supermarket is about a block from the dock. The closest bank in Hancock is Superior National Bank and Trust In Houghton, the closest bank to the dock is Well's Fargo Bank. Portage Health Center (906) 483-1000 serves both Houghton MI and Hancock MI. The main hospital is located in Hancock. It operates a large clinic in Houghton as well which can be reached at (906) 483-1777. The closest pharmacy in Hancock is the Apothecary (906) 483-1919, located at the Portage Health Center. In Houghton, the nearest pharmacy is Shopko Pharmacy (906) 487-9797, about 1.5 mi/2.4 km from the dock. There are lots of choices for restaurants and pubs in Houghton MI and Hancock. In Hancock, Gemignani's Italian Restaurant is well-regarded. If you like Mexican Food, try Habaneros Fresh Mexican Kitchen. In Houghton, you will find a larger selection as it is the larger of the two communities. Most restaurants and pubs are right in the downtown, about a block or two from the dock. For a casual pub experience, there is the Douglas House Saloon. Suomi Bakery and Restaurant carries some Finnish menu items. The Library Restaurant and Brew Pub carries a number of craft beers brewed by an award-winning brewmaster. They have an extensive menu and there will be something to please everyone. This part of Michigan has simply outstanding natural scenery. There are a number walking and hiking trails in both the immediate area and extending up the Keweenaw Peninsula. In Houghton MI, there are some 30 sites on a GeoTour that explain the unique geology of the Keweenaw area. Houghton also has a 4.5 mi/7.25 km waterfront trail. The Carnegie Museum has displays on the natural and human history of this unique area as well as interactive science exhibits. A quick look at this Houghton MI site will give you many ideas on getting the most of your visit. This Hancock MI site will give you more ideas on things to do and see in the area.